McFarlane Catalog - Request a copy or view it now!The new 2018 Catalog is now available!View the current Price List. Go to the Products page to learn more about the best replacement airplane parts available. To quickly add multiple parts to your cart, go to Quick Add. McFarlane Catalog - Request a copy today or view online! 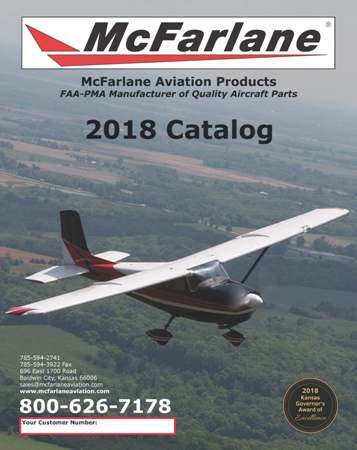 Subscribe to the McFarlane Aviation Products email list to stay up-to-date with new McFarlane products, promotions, and helpful maintenance tips. An email is sent out about once a month, and your address will not be shared with anyone else. To view previous newsletters go to the Newsletter Archives. View Customer Testimonials to see what others have to say about McFarlane! McFarlane was awarded the 2018 Governor’s Award of Excellence, the most prestigious award given to a business by the State of Kansas. Bent or Straight Door Hinges - Only from McFarlane! FAA-PMA solid welded design with precision pin holes for longer life. Get rid of that tired, old air box!! Install NEW, not rebuilt! Finally a cost effective, improved air/heat system! Don't waste your time with substandard seals, nothing compares! McFarlane's Australian seal kit solves the continuous leak and re-service problems with the Cessna nose strut. Go years without servicing! New Name, Improved Oiler, Same Great Oil! Featuring a re-designed needle oiler. Great for unreachable areas with traditional applicators. Save the labor of re-oiling the control system every year! Fast and Easy Window Cleaner! This stuff is so D A M good we had to share it! The patented McFarlane valve guide cleaning reamers have a pilot the same size as the valve stem. This properly sized pilot forces the reamer cutter to start straight and follow the correct valve stem path through the guide hole. Finally, a tool that is designed for the job! McFarlane's seat roller housings are now FAA-PMA approved! Finally an alternative for replacement seals! FAA-PMA approved grease felts and retaining rings for Cleveland, and McCauley wheels. Tire balance is important. Now it's fast, accurate and affordable! McFarlane's tire balancer is a suspension tire balancer with a patented design featuring a pivot point that is easily adjustable on-the-fly for maximum balance sensitivity.